I was hungry. No, scratch that, I was positively starving. In what is officially Italy’s food capital. The irony! Before anyone jumps to any conclusions, let me clarify that this was all my fault. Bologna is not to blame. Having arrived that morning from our stay in the Lakes region, we had set off almost immediately to discover the sights that Bologna had to offer. And but for a very short pit stop at the Mercato di Mezzo, for our daily rations of gelato and coffee, we had postponed our sampling of Bologna’s finest culinary traditions to the evening, in favour of its historical and cultural sights. Before said evening arrived however, hunger had reared its insatiable head. I was ravenous enough to eat a horse, as the cliche goes. But indulging oneself at 5.30 in the evening when one has a dinner reservation at a nice restaurant at 7.30 didn’t really make sense. 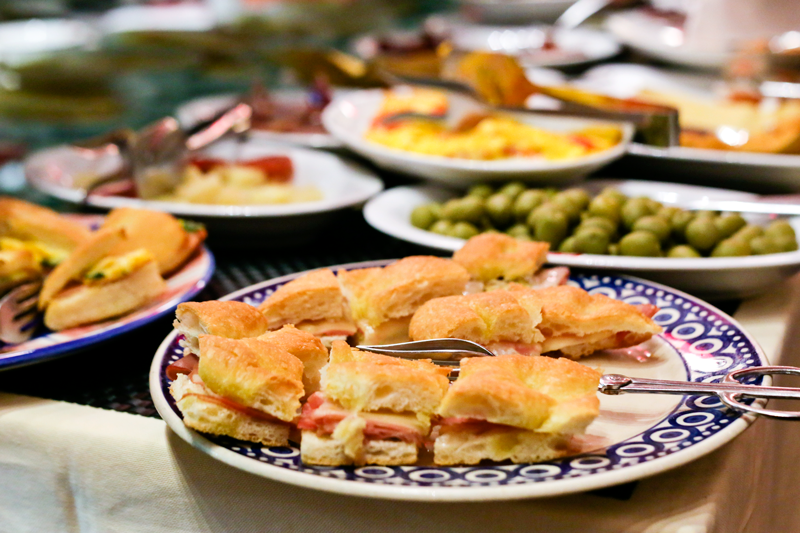 Luckily, Italy has a gastronomic tradition to rival the British high tea, or the Spanish tapas – the aperitivo. This is a wonderful way to enjoy evening cocktails with light nibbles, and whet the appetite, both literal and social, before heading for a proper dinner. 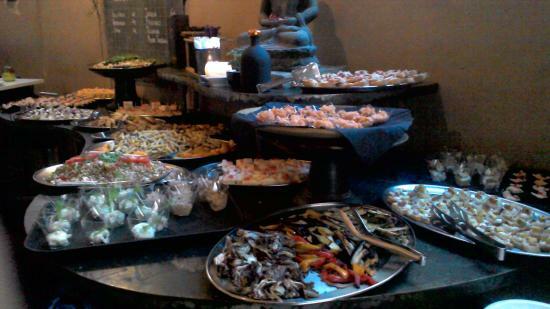 The word “aperitivo” means “to open”, and it is meant to signify the Italian belief that a drink opens up the appetite. Usually, one drink entitles you to one round or one plate at the buffet, so you should not go back for seconds unless you order another drink. Drinks run the gamut from wine to cocktails, but a classic aperitivo experience would involve spritzers like Aperol or Campari. 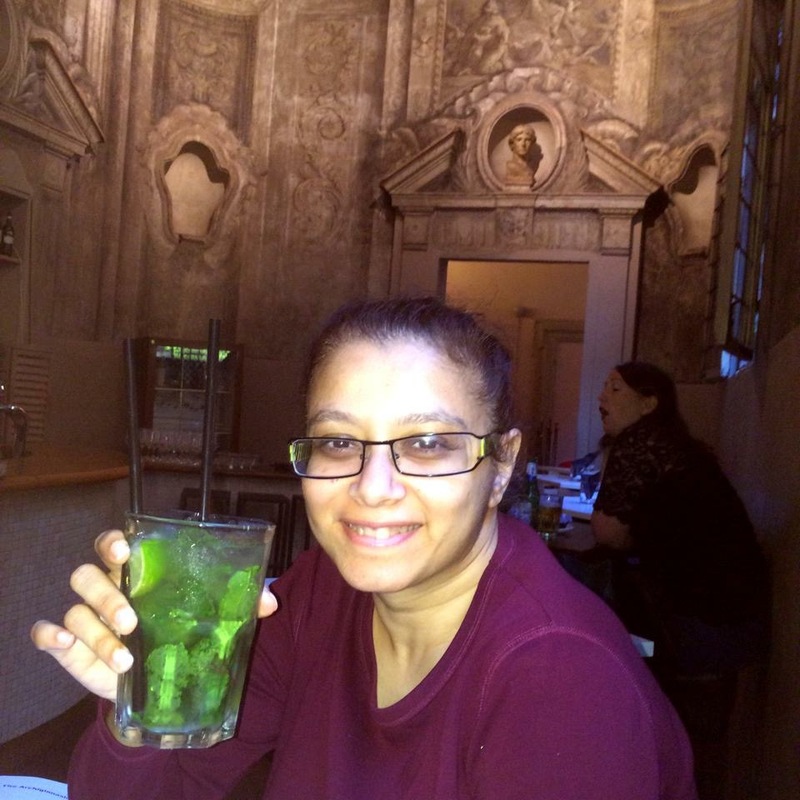 Our hungry selves were deep in student quarter of the city, which is where, as luck would have it, one of the city’s most atmospheric bars offer the aperitivo experience. We had to wait for almost 30 excruciating minutes before the large doors of Le Stanze opened at 6 pm, allowing us to walk into the stunning, high ceilinged lobby. 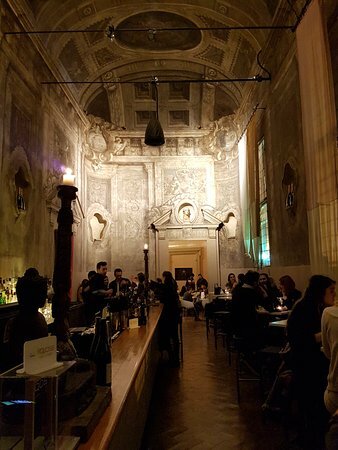 Le Stanze is a bar-restaurant housed in the former chapel within the Palazzo of the Bentiviglio family. 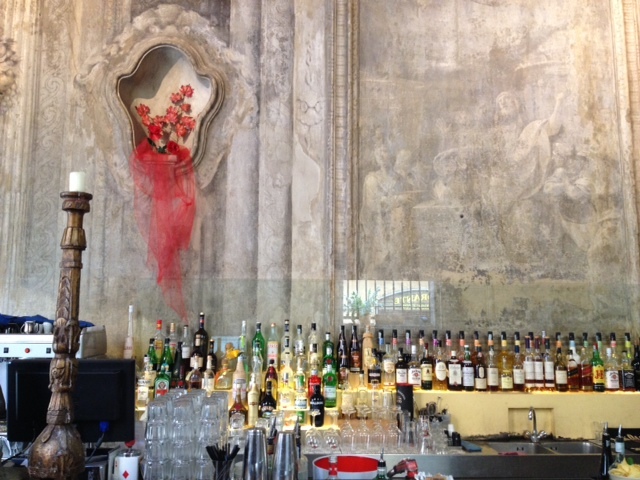 All the contemporary accoutrements of a contemporary bar – modern furniture, pulsing music, and intriguing cocktails, are set within the backdrop of 16th century frescoes in the “stanze” or rooms. 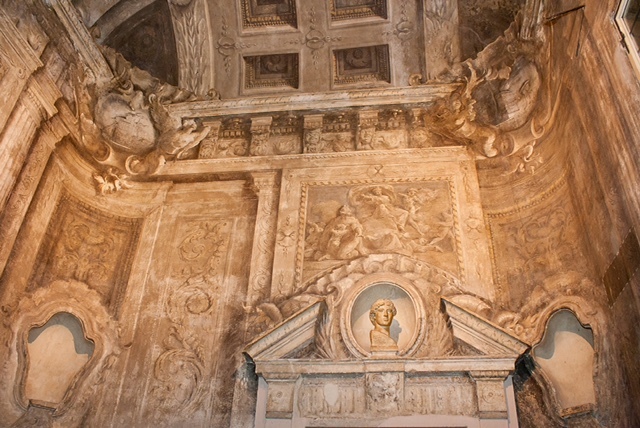 The frescoes display a variety of mythological and religious themes, executed in pastel colours in the trompe l’oeil style. Drinks at the bar are not exactly cheap at an average of around 6 euros for a glass of wine and 9-10 euros for cocktails, but by adding on 1 euro to the cost of your drink, you can take advantage of the aperitivo, which is offered between 6pm and 9pm every evening. The long bar counter is covered with a delectable buffet comprising finger foods, pastas, grilled vegetables, tiny pizzette, cheese and prosciutto platters and several salads. With a fairly large spread, there is enough to satisfy most appetites, including vegetarians, although vegans might struggle a bit. 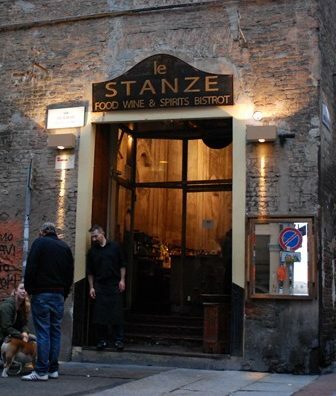 Le Stanze is also a restaurant, offering mains like steaks with gorgonzola for around 15 euros. As I drove away the dogs of hunger with a generous helping of the aperitivo offerings, washed down with an excellently executed Mojito, I finally relaxed in the spectacular setting. There is a sense of peace that you can still find here, beneath the thrum of the music and behind the sharp edges of the modern furniture and photographs. Beauty lingers in the light of the candles that bring the 400 year old art forms to life. 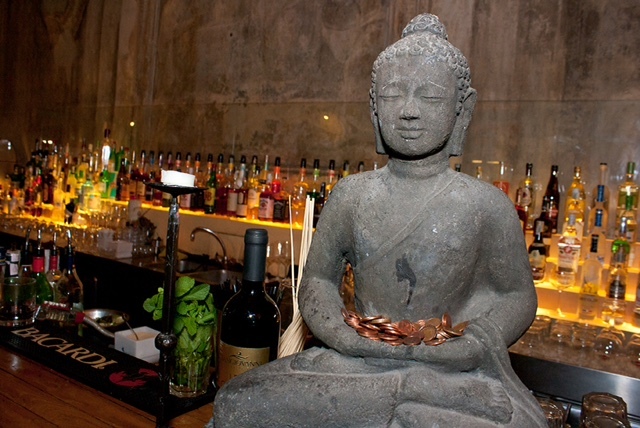 And one can feel positively spiritual looking at the bottles of spirits lining the shelves behind the bar. Sated, I let the truth wash over me. A chapel really can be the best place to elevate the spirits. When : Open every evening from 6.00 pm to 1.30 am. Aperitivo from 6.00 pm to 9.00 pm.